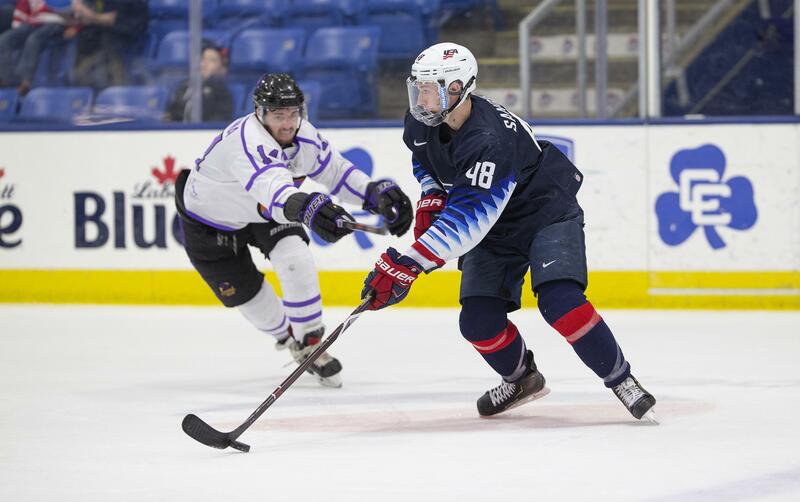 PLYMOUTH, Mich. - Ryder Rolston (Birmingham, Mich.) scored in the U.S. National Under-17 Team’s 4-1 loss in its last regular-season game at USA Hockey Arena against the Youngstown Phantoms on Friday, Apr. 12. The U.S. National Under-17 Team’s record is 18-27-3-5, while Team USA’s combined record in USHL play is 30-23-2-6. The Phantoms’ record is now 35-21-1-4 (W-L-OTL-SOL). Youngstown struck first at 2:52 of the opening frame. The goal was scored on the power play by Ben Schoen with an assist from Jack Malone. Despite two power play opportunities and landing 13 shots as opposed to Youngstown’s seven, the U17s could not even up the score in the first period. The score remained 1-0 in favor of Youngstown for the first half of the middle frame. Drew Commesso (Norwell, Mass.) stood tall in net, making 11 saves to keep the Phantoms at one goal. A turnover at center ice led to Rolston’s goal to tie the game at one apiece, with Carter Mazur (Jackson, Mich.) recording an assist. The tying goal came with 7:32 left to play in the second period. Team USA entered the third period looking to break through the tie, but the Phantoms went on to score three unanswered goals to seal the 4-1 victory. The Phantoms captured a 2-1 lead at 6:33. Matthew DeMelis was credited with the second goal, with assists from Schoen and Dalton Messina. Connor MacEachern extended the lead to 3-1 with 3:01 to go, and Jack Malone scored on the empty net to seal the 4-1 victory. NOTES: Team USA was outshot 26-25 … Team USA went 0-for-4 on the power play and 0-for-1 on the penalty kill… Eamon Powell earned Hardest Worker of the Game… Ryder Rolston earned Third Star of the Game… Matthew DeMelis earned Second Star of the Game… Ben Schoen earned First Star of the game. The U.S. National Under-17 Team plays its final regular season game tomorrow, Apr. 13, at 7:05 p.m. ET against the Youngstown Phantoms at Covelli Centre, before advancing to the First Round of the Clark Cup Playoffs.